7 night stay in the Gran Hotel Atlantis Bahia Real 5* plus - Fuerteventura with seaview room & wine. 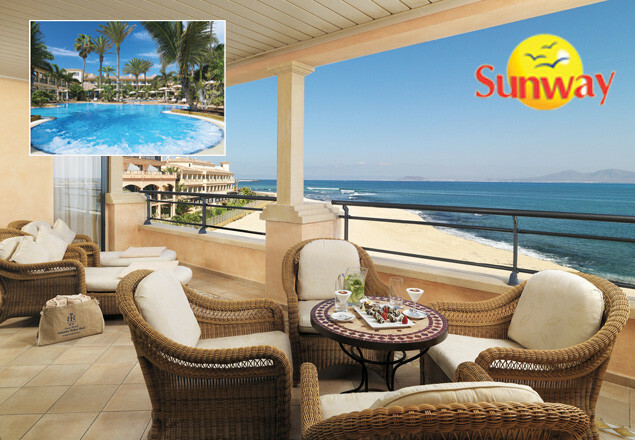 With this exclusive offer from Rewarding Times and Sunway Holiday's you can enjoy 7 nights in the Gran Hotel Atlantis Bahia Real 5* plus, Fuerteventura including flights for two people with a free upgrade from a Double room to a Double Sea View room and a bottle of wine on arrival. This luxurious seafront hotel is designed in Neo-Mudejar architecture. Gran Hotel Atlantis Bahia Real is an emblem of elegance, style and comfort, offering luxurious accommodation, superb facilities and a wonderful Wellness and Spa Centre. Located directly on the Atlantic Ocean with views across neighbouring islands surrounded by lush gardens. The hotel is 800m from the sand dunes and 1km from Corralejo central area with a daily courtesy shuttle to the Grandes Playas. Air-conditioned deluxe double rooms suitable for 2 adults with pillow menu, sat. T.V, telephone, mini bar*, wifi, safety deposit box, furnished balcony or terrace. Bathroom with bath/shower, bathrobes & slippers and hairdryer. Deluxe sea view rooms and suites with supplements. Deluxe Junior Suites with supplement are suitable for 3 adults & 1 child - minimum 2 adults, 3rd & 4th person sleep on pull out sofa bed. Board Basis: Bed and breakfast with option of half board/half board royale with supplement, Cleaning, towel & linen change daily, No of floors: 3, No of rooms: 242, No of lifts: 7, Official ratings: 5* Grand Luxe, Child age: under 13 years. Swimming pools & children's pool • outdoor jacuzzi • mini club (4-7 yrs) • playground • Bahia Vital spa & wellness centre (min age 16 yrs)• fitness centre • hairdresser* • wifi • lobby bar • 5 restaurants: Half board buffet, A la carte(Gourmet, Spanish & Japanese) & Las Palmeras for lunch • Ocean view El Mirador piano bar. Free upgrade from Double Room to Double Sea View Room. 1 bottle of wine on arrival. 2 free entrance per person per stay to the spa. This holiday has to be taken on select dates in the months of November and December 2013. Flights depart every Saturday so you can choose from 2nd / 9th /16th /23rd or 30th November – 7th & 14th Dec) (depending on availability). Offer includes flights, transfers, accommodation, breakfast, taxes and charges / 20 kilo checked in baggage per person + Sunway Rep Service. Limited number of places on this offer. Offer must be booked with Sunway by October 4th 2013.